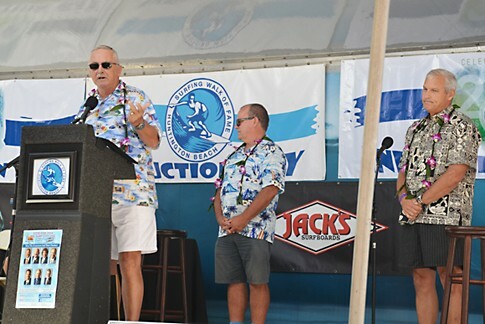 Vince Moorhouse "2014 Honor Roll"
PHOTO: Moorhouse succeeded the legendary Bud Higgins in 1957 as chief of the lifeguards. 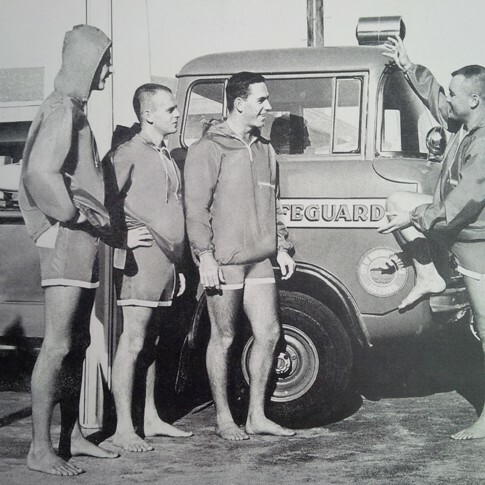 He mentored young guards who would oversee Huntington’s beaches for the next 50 years with Bill Richardson, left, and Max Bowman – who both would become lifeguard chiefs and Ray Bray. PHOTO: Induction Day 2014, Dan Moorhouse and Bill Richardson in front of the SWoF Induction poster. Photo courtesy of Lew Harrison. Way back when, lifeguards tended to portray that beach bum image – hanging out in the sun and surf, chatting up the ladies and talking story with the boys. And the Huntington Beach squad was no different. That is, until Vince Moorhouse came along. Moorhouse is credited with transforming the HB lifesavers into a top-shelf professional outfit whose surf rescue techniques have been adopted worldwide. 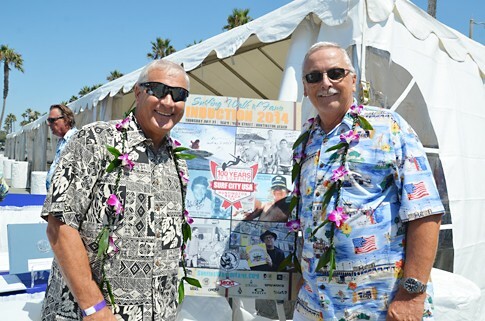 And after Moorhouse died at the age of 60, the Huntington Beach City Council approved a memorial monument to be erected in front of the beachfront lifeguard headquarters, which is also named in Moorhouse’s honor. Today he receives yet another shrine in Huntington Beach with his newly-minted Honor Roll plaque. PHOTO: Lifeguard Bill Richardson tell the history of inductee Vincent Moorhouse as PT and Vincent's son Dan enjoy the memories.